Of Interest: This enhanced-color image shows Titian crater (center) and is similar to an image that recently appeared in the 1 May issue of Science magazine. The enhanced-color view was created by using high-resolution images taken in all 11 WAC filters (one of which is shown in a previously released image) and comparing and contrasting them to accentuate differences on Mercury's surface. 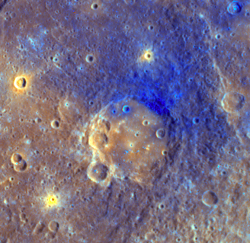 Such color differences can be used to learn about the history of Mercury's surface in this area. In the enhanced color, the smooth floor of Titian is a brighter orange color than the surrounding area, likely due to being filled with volcanic material. Ejecta from Titian appear blue and cover much of the surface surrounding the crater. This material was excavated from depth during the crater's formation. Later impacts, such as the one that produced the small crater that appears yellow in the upper center of the image, excavated material from below the Titian ejecta. This yellow-appearing material was present at or near the surface before the impact that created Titian and is a different composition (and thus, color) from its surroundings. Impacts make it possible to assess how Mercury's crust varies with depth and ultimately how the crust evolved through time.